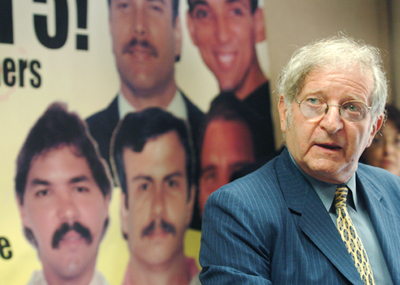 In representation of the International League of Peoples’ Struggle and on my personal behalf, I wish to express sincerest condolences over the passing away of the world renowned human rights lawyer and fighter for justice Leonard Weinglass to his family and his closest colleagues and friends. We share their deep sense of loss. At the same time, we find comfort in his many outstanding achievements in defense of the oppressed and exploited people and all those persecuted for standing up for the rights and interests of the people. We consider Lenny’s death as an occasion for celebrating his meaningful life of service to the people, for expressing gratitude to him and for drawing lasting inspiration from his sacrifices, struggles and successes. Among the many cases in which he acted as defense counsel included those of the Chicago Seven, Kathy Boudin of the Weather Underground, Angela Davis, Daniel Ellsberg, Mumia Abu-Jamal, The Cuban Five and Julian Assange of Wikileaks. Weinglass was a leading figure in the US Civil Rights Movement and international struggles for justice. He was the co-chair of the international committee of the National Lawyers Guild for many years. He was very active in supporting the Filipino people’s struggle against the Marcos fascist dictatorship. He attended and assisted the Permanent People’s Tribunal that tried Marcos et al in Antwerp in 1980. He continued to cooperate with Filipino human rights and lawyers’ organizations in exposing human rights violations under the post-Marcos regimes. In recent years, he took up the case of Melissa Roxas and was involved in preparations for possible legal action in the US against Gloria M. Arroyo et al for human rights violations. I take this occasion to make a personal note and thank him for being my lawyer of record, together with Leonard Boudin, in my efforts since the late 1980s to secure a visa to visit my mother and siblings in California and to consult with my lawyers in the human rights litigation against the Marcos estate. He also provided legal advice to me and my chief Philippine legal counsel Atty. Romeo T. Capulong in connection with the false charge of multiple murder heard before Philippine Senate committees in 1989and 1990 and likewise in connection with my being arbitrarily listed as terrorist by the US and other governments from 2002 onwards. I first met Lenny personally in Manila soon after the downfall of Marcos when he went there to greet and congratulate political prisoners like me who had just been released from military detention. We continued to be in touch with each other regarding my visa case as well as the series of causes that he took up, including the Mumia Abu-Jamal and Cuban 5 cases which brought him to Amsterdam a number of times. We of the International League of Peoples’ Struggle accords the highest honor and expresses the deepest sense of gratitude to Leonard Weinglass for his ardent support for the principles and objectives of the ILPS and for his constant willingness to provide legal assistance to all the organizations and people involved in the 18 concerns of the ILPS. May his memory, his commitment to the cause of justice and liberation and all his service to the oppressed peoples and the victims of human right violations continue to inspire all of us now and in coming generations!